Richard II is one of Shakespeare’s more difficult plays. Even contemporaries were hard pressed to categorise it (it was initially regarded as a history rather than a tragedy) and it is a period of English history that few are familiar with. It is encouraging then that Joe Hill-Gibbons has pared the play back to its essentials, managing to compress the action into 1hr 40 minutes with no interval. The idea seems to be that, taken at a gallop, the audience gleans the essence of the play much better than having to withstand the usual much longer versions. 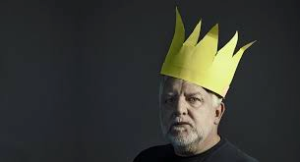 The cause is furthered considerably by having an actor of the quality of Simon Russell Beale in the lead. While considerably older than Richard (who was only 33 on his death) Russell Beale conveys both the king’s indecisiveness and preoccupation with his divine right to perfection. At the outset his adjudication of the dispute between Bolingbroke and Mowbray, where the former has accused the latter of conspiring to murder the Duke of Gloucester, shifts from advocating a duel to mutual banishment, the terms of which are seemingly arbitrary. Richard’s interaction with his uncle (Bolingbroke’s father), John of Gaunt is also pitch perfect and Joseph Mydell gives the role suitable gravitas and solemnity – particularly important given his key speech describing an idealised England while prophesising its downfall. This is undoubtedly a grim play, but this production does have moments of humour, with a scene where a significant number of the players successively (and with increasing venom) through down their gauntlets in challenge. Nevertheless, there are issues with this production. First, its very brevity does have shortcomings. The original play has some 40 parts, yet here just 8 actors manage all of them, remaining on stage throughout a performance that takes place in a 3-sided metal box. This involves Saskia Reeves playing four different parts (2 male and 2 female). She is an actress of great talent, but the changes do require an alert audience, as does the dead John of Gaunt quickly becoming Willoughby. Similarly, despite a high body count there are no weapons, merely buckets of water, blood and soil that are deposited on the protagonists with increasing abandon, again requiring a lot of work from the audience. Nevertheless, once you get over the assumption that one bucket may be full of feathers (it is panto season after all) the effect does have an appropriate pathos. The other issue is one of interpretation and, while Leo Bill gives an impressive performance as Bolingbroke, some may take issue with the nature of the character he portrays. The idea of describing a move from a king who believes he rules by divine right, to one who rules through his political and intellectual abilities seems lost in this production. Bolingbroke is not shown with that strength of character and may not be the man many would see becoming Henry IV. However, such criticism may be unfair given that this approach does sit well with a “hollow crown” and is not inconsistent with the action. Overall it is a brave and worthy attempt at a difficult play and ultimately the pace of the production and the strength of the performances make for an entertaining evening. One word of caution – the vigour with which the blood, soil and water is thrown may make front row seats a little less comfortable. The play runs at the Almeida until 2nd February.